Audio of Piano Quartet: All Movements mp3. Quartet for Piano, Violin, Viola & Cello was completed in February 1986 with assistance from the Queen Elizabeth 11 Arts Council of New Zealand while the composer was in Dunedin as Otago University's Mozart Fellow for 1986 and 1987. The Piano Quartet was first performed in a Music Department concert at Marama Hall, University of Otago, Dunedin, New Zealand, on 25 March 1986. 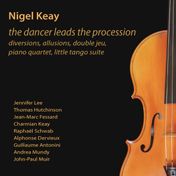 On this occasion it was played by Angela Campbell (piano), Miranda Adams (violin), Nigel Keay (viola), & Robert Davis (cello). It was also recorded in 1987 by Timothy Dodd (piano), Miranda Adams (violin), Allan Starrett (viola) and Judith Williams (cello) in the Albany Street, Dunedin studios of Radio New Zealand (producer John Clarke) and broadcast nationally on its Concert FM station. The work features an individual harmonic language and often utilizes the extreme ranges of each of the instruments, particularly the piano. The macro-structure employs a fast-slow-fast format with some interrelationship of the motivic material between each of the movements. Harmonically, the work is built on a six-note polytonal chord (a major and minor triad superimposed) and this is often given to the strings in various transpositions, making double-stopping a technique in evidence throughout the score. The first movement starts with a piano-only introduction which is followed by toccata-like material. Artificial harmonics are extensively used by the strings to open and close the second movement. The piano plays a minimal role in this movement with a short central solo interlude. A new studio recording was produced as part of the Resound project started in 2010 - an initiative of SOUNZ, RNZ Concert and NZ On Air. It was played by the New Zealand Trio with Robert Ashworth (viola) and introduced by Kenneth Young. This recording was first broadcast on 5th November 2013 on Radio NZ Concert and remains available for replay on Radio NZ Concert Resound.